Hiya guys! I have a quick post to share with you as I get ready to go to the movies. I'm going with the hubs to see the new Star Wars movie, Solo. Part of his birthday celebration otherwise I'm not too sure I would go. It just didn't look too exciting to me, what about you guys? Any Star Wars fans here? Moving on though to the topic on hand... or on nail. Okay, that was a terrible attempt at a pun so let's talk polish before you leave. Today I'm sharing swatches for Shimmy & Shine by Sassy Pants Polish, which is part of the first Lacquer Collab. 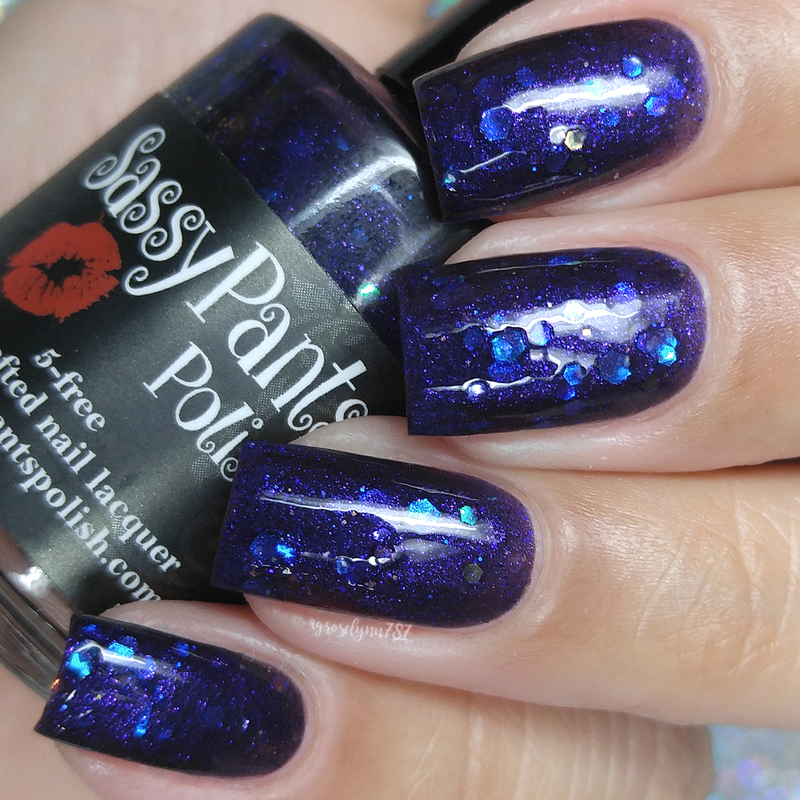 Think Polish Pickup but on a much smaller scale as it only features 12 polishes each month. For the month of May the theme the makers got to with it is Glitter & Glam, which is sure to start this new collab with a bang. Without further ado, let's get to the swatches! 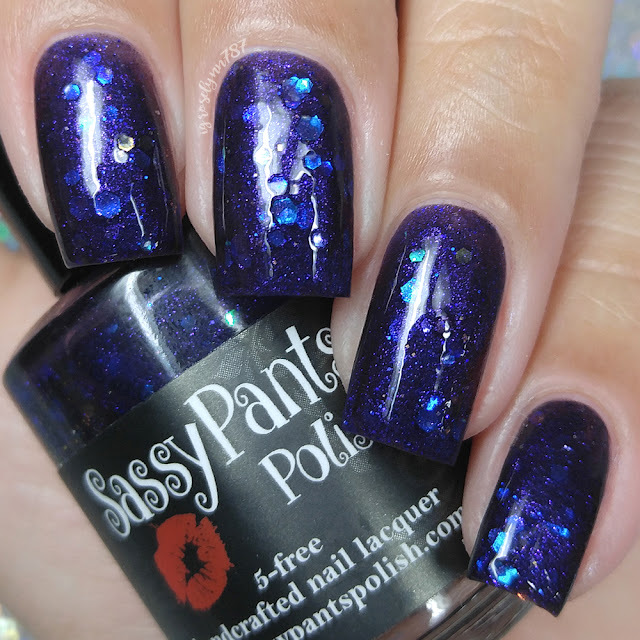 Shimmy & Shine by Sassy Pants Polish will be available for pre-order through Lacquer Collab May 18th until Tuesday, May 22nd. Each full-size 15mL retails for $12 and there is no cap. Once it's gone it won't be back! Shimmy & Shine can be described as a rich dark royal purple jelly base with lighter purple sparkles, iridescent glitters that shift from purple to blue and chameleon glitters which shift from blue to purple to red. Isn't this a unique combination?! I mean those iridescent glitters are everything and give the base a stunning pop factor. That said, I'm not a fan of the color to finish combination. I can't help but feel like it would have worked better as a crelly finish with a lighter purple hue as the base. In any case, the color does look really good against my skin-tone. The formula was extremely sheer even for a jelly finish in my experience. It did build-up for full coverage with no visible nail lines. Consistency wise it was on the thick side and I opted for some thinner for smoother coats. Unfortunately even after thinner I had some problems and the polish felt thick on my nails. 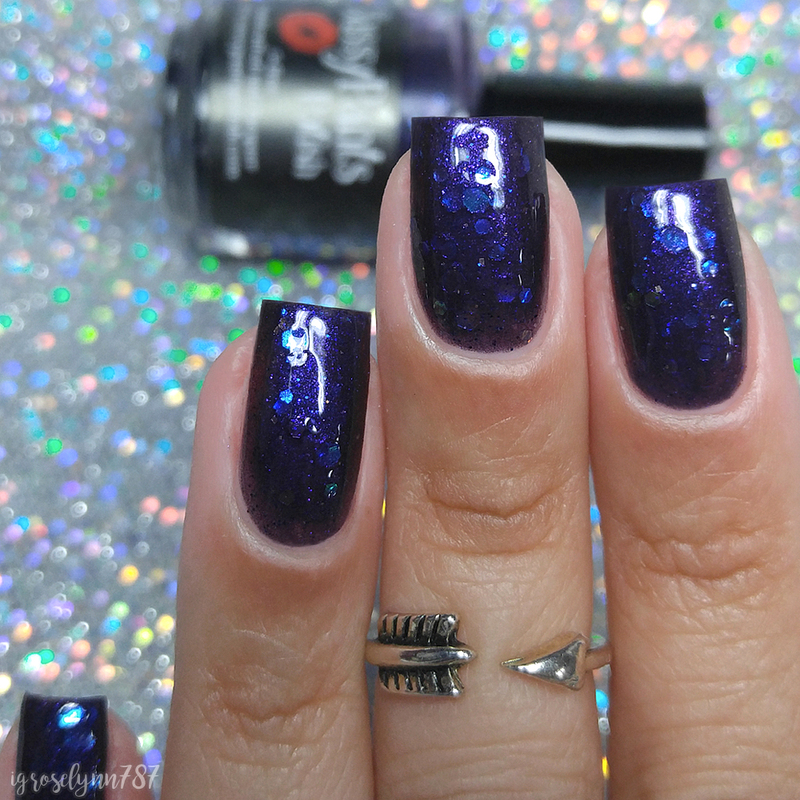 The finish is very jam-packed with large glitters that spread evenly throughout the nail with no need for placement. It dries down to a textured finish that needs a coat or two of topcoat to smooth out. I didn't experience any staining on removal to either my cuticles or nail beds. Shown in two to three coats and sealed with a glossy topcoat. Please note: I was the only blogger/swatcher to experience these issues. While most agree the base is on the thick side, it was manageable and didn't cause so much build-up on the nail as I had. 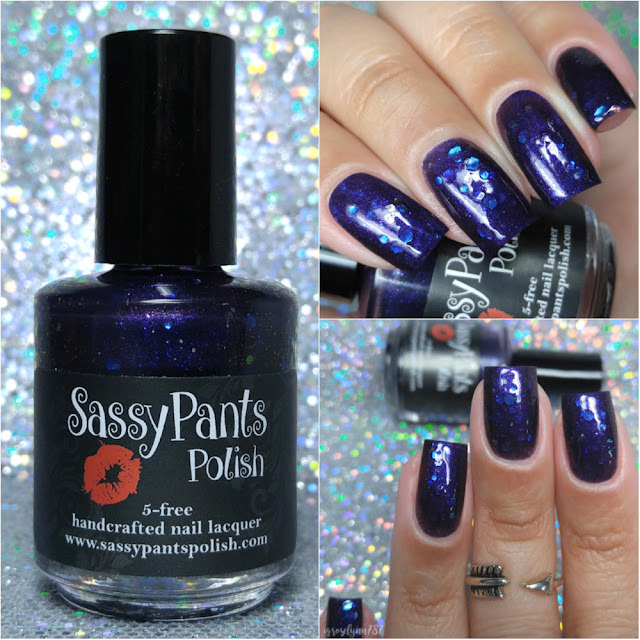 To recap, Shimmy & Shine by Sassy Pants Polish will be available for pre-order through Lacquer Collab May 18th until Tuesday, May 22nd. Each full-size 15mL retails for $12 and there is no cap.